A striking piece in .935 silver. Beautiful detailing of the smiling moon glancing over at the sitting cat. ​Smiles are what you will receive from your friends. Each piece is individually made in a "lost wax" process. Each fan pull is hand crafted and as individual as any of our kitties. ​That means they are all a little bit different. Cheryl will strive to make your piece as similar to your choice as possible. Made of Lampwork, Crystal, and Pottery beads, with Brass findings and 6" ball chain. Designs and colors available by special request. 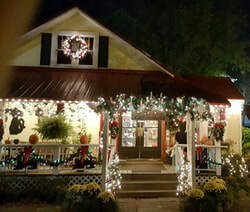 Established in 1985, by Cheryl and Phil Anderson as a warm and welcoming place for "cat people" as well as the curious shopper visiting the Smokies. 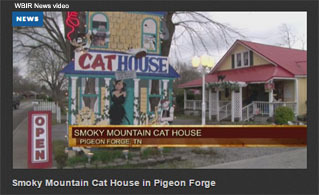 The Cat House is a place to relax, were you can be yourself and show off your favorite cat pictures or share a story with like minded cat lovers. We feature the "things" that make us and our cats happy, but most of all we hope to be your home away from home where you can pet and play with a cat when you're away from your own!